The bass has always been an essential component of the jazz rhythm section, simultaneously holding down the groove while marking out the changes. Bassists of the hard-bop era often got little in the way of solo space (they were too important to be allowed to wander off by themselves) but throughout the 1960s and 70s, perhaps thanks to the gargantuan presence of Charles Mingus, they began to take a more prominent role. Several highly influential figures appeared, like Ron Carter and Dave Holland along with many others. Cecil McBee is perhaps less well-known, but equally talented, having played on seminal works by the likes of Alice Coltrane and Pharoah Sanders. This album finds him firmly placed as leader of an avant-garde group with a distinctly spiritual edge. Mutima is the key to the spirit and culture of black Africa, according to the sleevenote; McBee's compositions certainly evoke that spirit. The music is at times inspirational. The opening "From Within" is a bass solo with McBee playing two acoustic basses simultaneously. The idea of an 11-plus minute bass solo may terrify some, but this is riveting. Not only does he play the basses, but for a section he plays the feedback created by the amplification of both instruments. The sounds he creates are otherworldly and exciting, and not always easy to identify as being produced by an upright bass. "Life Waves" is an ensemble piece, but with McBee taking a prominent melodic role, and demonstrating enormous technical skill with some very fast lines. The other standout track is "Mutima" itself, which is virtually indistinguishable from some of the work McBee undertook with Pharoah Sanders a few years earlier. Most Strata East recordings are pretty hard to come by, but thankfully this one has been made available as a reissue in recent years (although only on vinyl) so should be pretty easy to track down. 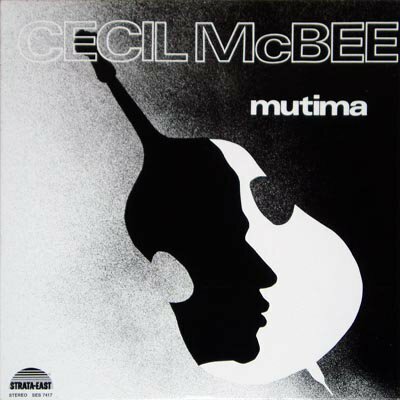 speaking of Cecil McBee's record 'Mutima'- i remember playing the last track- Tulsa Black- all the time- a great tune!